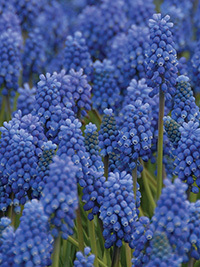 Commonly known as grape hyacinths, muscari flower in early spring. Their low height makes them ideal for borders and beds. Minimum order 25 bulbs. Beautiful new hybrid, a great colour and strong grower. 15-20cm tall, early spring flowering. Fragrant.